So, Katherine Verdoux (Erika Eleniak) is coerced by down on his luck PI, Rafe Guttman (Dennis Miller) to find her missing brother, Caleb (Corey Feldman). Once Guttman figures out what’s going on – and it doesn’t take much detective work – he’s out to rid an old mortuary of its vampy harem. Yes, it’s another vampire comedy, complete with bloodsuckers that explode when doused with holy water from Super Soakers, which seemed very THE LOST BOYS (1987). And the story’s foundation seemed to be based upon 1986’s VAMP staring Grace Jones. Of course, the two aforementioned movies are both superior to this initiative that sunk the “Tales from the Crypt” franchise. Granted, we get Dennis Miller and his smarminess to the nth degree, and everyone plays along with the comedic gag, including the lovely Angie Everhart as Lilith, but the barbs in VAMP and LOST were better and funnier. Director Gilbert Adler, who has a very diverse portfolio as a producer (war, horror, drama, comedy, etc. ), stayed true to the old “Tales from the Crypt” cable horror salute to the great comic book genius, William Gaines, of EC fame (in the movie, they named the cemetery after him). 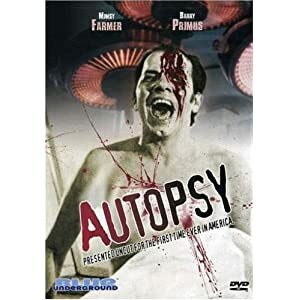 Yet, even with great character actors as William Sadler, Aubrey Morris and Phil Fondacaro, the story just serves as a fun romp with little bite. There is absolutely no suspense or surprises, and even if some of the exploding vampires are “cool”, it seems as if the fangs were filed down for this one. Tom Priestly, Jr., director of photography did an excellent job with some wonderful camera angles to please the eye. Then again, with all his experience, from THE FRENCH CONNECTION to A LEAGUE OF THEIR OWN, and dozens more, it’s no wonder his work alone kept the story moving. Make-up effects were hit and miss, as well as visual effects, though with the comedic element, even the poorly executed material worked with the tongue-in-cheek feel of the movie. However, when the effects really triumph, it is thanks to Priestly’s camera work as well as Stephen Lovejoy’s sharp editing. The one actor who seemed to have the most fun, however, was Chris Sarandon (of FRIGHT NIGHT and CHILD’S PLAY fame). As Reverend Current, he certainly dove into the role to have one hell of a good time. And his gung-ho evangelist over-acting brought more laughs than Miller’s witticisms. All in all, the movie is fun, yet disposable. It doesn’t have that special edge to make me want to put it up on the shelf. Maybe if the final scene wasn’t so telegraphed, it could have finished on a stronger note worthy of remembering. Is that a baby or Chucky? Laura Harring (Stacey) was beautiful in David Lynch’s fantastic MULHOLLAND DRIVE (2001) – hell, it earned him a Best Director Oscar nod and put the rock solid and stunning Naomi Watts on the map. And in this 2007 foray, Harring is still beautiful yet gives us a bit more as the protagonist coping with the death of her husband as she struggles to raise their son in South African back country. But Harring is not alone. Young Thandi (Mosa Kaiser) takes care of her and the town doctor (Pete Postlethwaite) always happens to be Johnny on the spot when crisis looms. Of course, no one (except Thandi and some locals) believes Stacey is seeing her dead husband and that his essence has turned their son into a conduit for murderous violence. And this is where Lamberto Bava’s and Silvia Ranfagni’s story falls way off the mark and completely derails. Also directed by Bava, the son of Mario Bava of BLACK SUNDAY (Italy, 1960) fame as well as many other Italian horrors, the story seems to play out as a tragic romance turned ugly. However, why did it turn ugly? Stacey and Mark (John Hannah) loved each other very much, and Mark was a kind, funny and passionate man. Therefore, seeing him manifest as an angry spirit hellbent on killing makes absolutely no sense. And once logic is thrust by the wayside, not much else matters. Worst still, the special effects and art department created a baby that looked and acted like Chucky without hair – though if they had used Brad Dourif’s voice, I would have loved it. Speaking of sound, like most Italian horrors it was awful as if the entire movie had been shot in silence and complete audio tracks were added later. The only thing worse, also a mainstay of Italian horror cinema, was Raimondo Aiello’s hack and slice editing. Why Italian horrors have not nailed these elements down over the past fifty friggin’ years is beyond me. And maybe this is why Italian horrors, except for Michele Soavi’s amazing CEMETERY MAN (Italy, 1994) and Corrado Farina’s enticing BABA YAGA (Italy, 1973), are weak due to over-acting and poor shooting quality. As far as horror cinema goes, it is usually over-rated – and why Dario Argento, Italy’s slightly better version of Ed Wood, is held in such high regard is beyond comprehension. GHOST SON is no different. And even with some great acting from Harring, Hannah, Postlethwaite and Kaiser, the endeavor does very little to capture the imagination. If anything, it will leave horror fans wondering why the story took such a non-sensical left turn. No doubt, “possession” movie fans will be extremely disappointed. If it wasn’t for the stellar performance of Amy Seimetz as Sarah, I would have walked away from this subtle attempt at a thriller after the inciting incident. 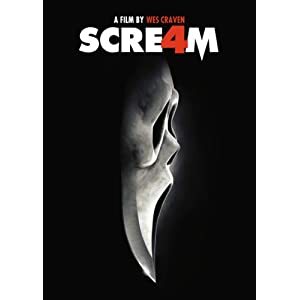 When convicted serial killer Garrick Turrell (AJ Bowen) escapes from police custody, and goes back to his old tricks, his former girlfriend may end up a victim. 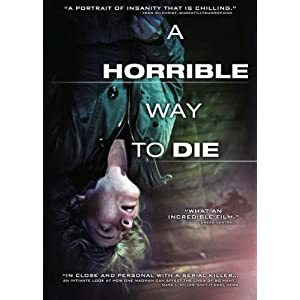 A HORRIBLE WAY TO DIE is straightforward with one grand surprise, but to get there, the audience must sit through a molasses-moving enterprise that doesn’t maintain interest or suspense. Simon Barrett penned this tale and Director Adam Wingard made sure it ended up in the can. However, unlike skilled directors reveling in subtlety, such as Lance Weiler and his riveting THE LAST BROADCAST (1998) and fantastic HEAD TRAUMA (2006), Wingard’s artsiness gets in the way of story, and bogs the tale down at many a turn. And although Bowen shined on occasion as the seemingly reluctant and guilt ridden killer of women, Seimetz kept the show afloat as the mentally scarred woman trying to hide in her Alcoholics Anonymous group to get through another day. Her performance is genuine and strong, reminiscent of Kristin Scott Thomas in I’VE LOVED YOU SO LONG (France, 2008) with some of Vera Farmiga’s strength in DOWN TO THE BONE (2004). Sadly, the bulk of the cast, especially Joe Swanberg and Lane Hughes, forgot they were trying to do something better than a guy running around with a super 8. This is most evident during that big surprise when Barrett went on vacation and forgot that quality dialogue was sorely needed; even worse, performances clearly waned during this vital scene. Sadly, that’s the moment that sank this picture for good. If it had been executed differently, this movie would have scored higher on the charts. Instead, it’s an “also ran” fit to collect dust on a shelf. As an aside, Barrett took a page from Ted Tally’s script for SILENCE OF THE LAMBS (1991) and Wingard couldn’t help but continue with the lame homage, and mimicked Director Jonathan Demme’s approach to Turrell’s escape. Remember when Hannibal is all wrapped up like a sausage and his eyes zero in on Dr. Chilton’s pen? Well, it’s an itty-bitty screw rolling around in the bottom of a police van that gets Garrick Turrell’s attention. As in SILENCE, we never see how the maniacal killer gets a hold of said object. Regardless, this little element proves to be the key to freedom so the bloodletting can commence. However, Wingard does have some skills, and cinematographers Chris Hilleke and Mark Shelhorse helped him look good on occasion – though their extensive use of out of focus shots and out of frame maneuvers became tiresome and undermined their attempts at thematic resonance. If you’re a serial killer fanatic, stick with John Naughton’s HENRY: PORTRAIT OF SERIAL KILLER (1986) if your desire is to get into the disturbing muck of it all. Otherwise, leave this one behind – unless you want to see how Seimetz may have broken through to bigger and better things.